Last week I used the term “neck collars” to describe what I bought from Perri’s Leather for the horses, but Perri’s calls them neck STRAPS, in case anyone was searching. But as long as I am thinking about collars, how about breast collars? I have a saddle that is lacking the typical “D” rings for “normal” breast collar attachment, so I finally got around to looking for one of those breast collars that attach through the gullet of the saddle. Turns out they are called “pulling collars”. And while I was searching around I also found there are breast collars called “tripping collars”, so here is a little run down on breast collars, because although I have more than one breast collar, apparently, I really knew very little about breast collar styles! The Normal-to-Me breast collar: These hook to the “D” rings on the saddle and go between the horse’s legs and hook to the cinch. 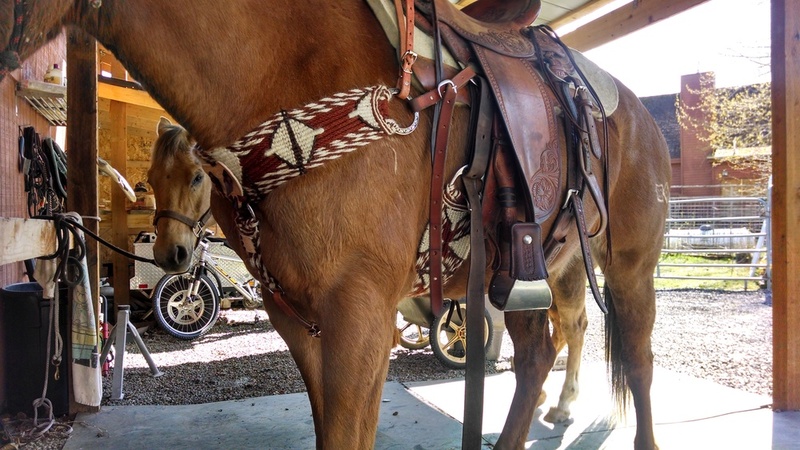 They can be decorative for showing and also work well for holding a saddle in place when riding in the mountains or doing working cow horse stuff. They are also good for for roping. This one is neoprene from SMX. Neoprene is easy to clean! This one would be good for holding a saddle in place, but would probably not hold up for roping. Here are some that are very decorative from Double J! My two leather ones of this “normal” style are pretty plain. I bought one for a dollar at a tack sale! The Pulling Collar: According to Cowboy Way: “Pulling breast collars are popular among Western riders, particularly ranchers and ropers. 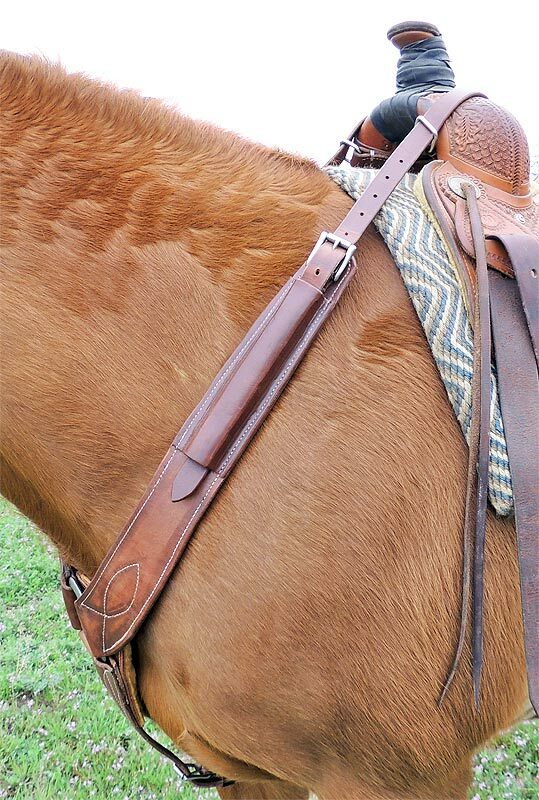 Instead of crossing a horse’s chest from side-to-side like some other styles, pulling breast collars sit just above the line of a horse’s shoulders and buckle around the pommel of the saddle. 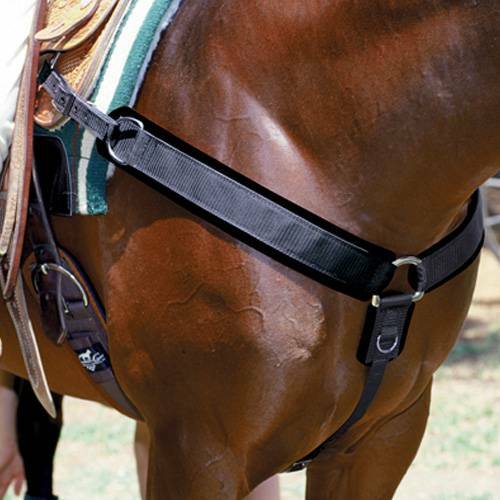 According to ranchers, ropers, and others that prefer this style of breast collar, pulling breast collars allow the horse more freedom of shoulder movement and better leverage when pulling.” This is the type I just purchased! 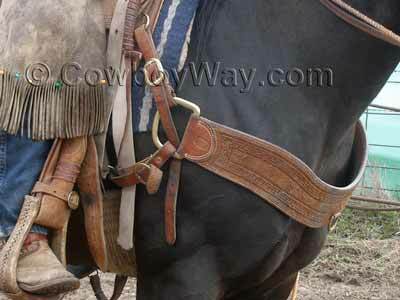 The third type I came across was a “Tripping Collar” and looks like the breast collar on my pack saddle. They are quite broad and distributes any pulling weight across a large surface area. They hook to that D ring my saddle is lacking and also to the cinch in a V. They are popular with folks that do steer tripping, and, as I mentioned, on pack saddles. Steer Tripping is a rodeo event and is also a technique that a cowboy out alone can use to, say, doctor a steer, says my friend Ed. I can’t tell if this guy has a tripping collar on or not. Here is a breast collar that is a combination from DR Custom Cinches. It attaches like a tripping collar near the shoulder and the “normal” style–going between the legs. I got my pulling collar this week and have been using it on Indy. So far so good. And finally, here is a short video on breast collars from Weaver Leather.